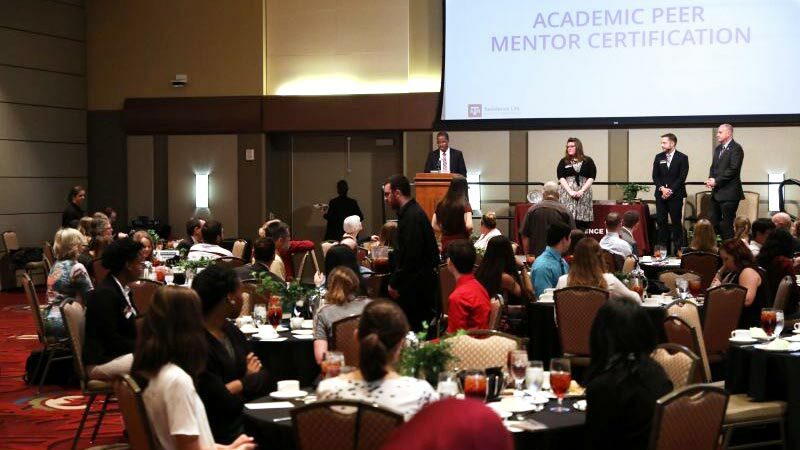 The Department of Residence Life recognized eight Texas A&M University students and their faculty and staff mentors during its inaugural Honoring Excellence Awards Ceremony, held on campus this semester. The award process recognizes on-campus students who have demonstrated academic and leadership excellence, including those who achieve Distinguished Student status (Student Rule 11), and gives these students the opportunity to nominate faculty and staff members for awards. This year’s ceremony honored seven faculty, one staff member, eight academic peer mentors, and on-campus residents who achieved Distinguished Student status. With Distinguished Students as the audience, Residence Life also recognized eight academic peer mentors as they obtained the first and/or second levels of a three-tier certification program. The three levels of certification offered are: regular certification, advanced certification, and master certification. In order to complete the first level, academic peer mentors must accumulate over 50 certification hours, and must log over 75 hours of direct mentor time with students for level two. Master certification requires a total of 100 logged hours of student interaction and is the highest level offered by the College Reading and Learning Association.